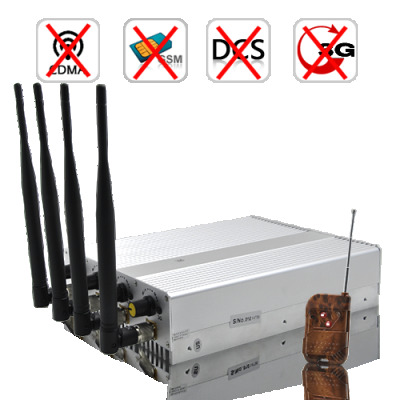 Successfully Added High Power Cellphone Scrambler (CDMA / GSM / 3G / DCS PHS) to your Shopping Cart. High Power Cellphone Scrambler - comes with sensitivity control that enables you to partially and selectively block any cell phone signals, including GSM, CDMA, 3G and DCS PHS in a 40 meter radius! It's easy to use. With the remote control, you can turn the device on and off for instant jamming and unjamming. The product is an industrial strength stationary scrambler, however, with the included mounting kits, it can be mounted on the wall in any locations where a phone call would be particularly disruptive, for example, churches, hospitals, libraries, museums, movie theaters, class rooms, and places for business meetings and legal proceedings. Compared with other scramblers / jammers of the same strength, this product offers better quality and a lower price. It is now available in our warehouse for single and bulk order purchases. Order today and we'll express ship it out tomorrow, brought to you by the leader in China Electronics - Chinavasion. PLEASE USE THE REMOTE CONTROL TO TURN THE JAMMER ON/OFF. Definitely. As long the user is using a 3G cellphone operating in the frequencies between 2110-2170MHz he won't get a signal within seconds of you turning on this jammer. Davvero ottimo e ad un ottimo prezzo!!! on 2011-09-11 15:09:40 its cool.